Coming home (after months of rehabilitation following a diagnosis of transverse myelitis) was a moment of both joy and caution. For the first time in almost two months, Rita and I would be together again under the same roof. We could hug and kiss and talk endlessly and effortlessly once more. But at the same time we also had a universe of adjustments to make, so much to learn. There was love, but also changes and risks in abundance. As the delivery service wheeled me up the ramp to our home, Rita stood there, smiling, waiting for me. I saw her and I cried. That was it; I just sat there and sobbed, shuddering and weeping. It had been so long since I had been home; I was a totally different person returning to an unknown world. Now I was with Rita again. Yet all I could do was let the tears flow. Not just once either; this went on for days, weeks, months, even. Everything, any little detail, set me off. If it reminded me of the old world, of what I had lost, I cried. When some incident highlighted my new existence, what I was adjusting to, I cried. It didn’t really matter how big a deal the item was, I just cried. That first weekend, for example, as a treat, Rita got fresh bagels on Sunday with cream cheese and smoked salmon; in response, my tear ducts opened. This was real food, food I couldn’t dream I would ever taste again. I cried as I gobbled up the morsels and the memories. There was also a feeling of helplessness, of terrible dependency. 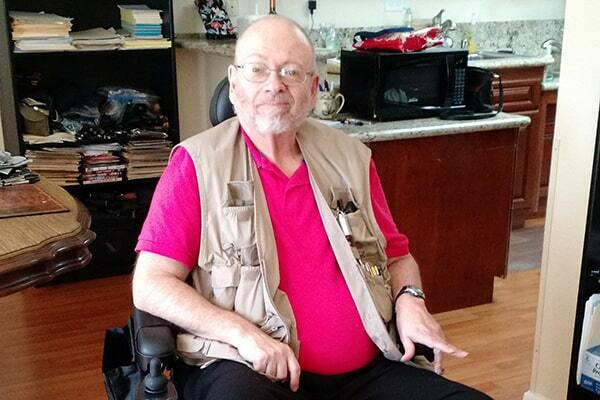 Of course, in the hospital I had depended on others, but when I got home the reality of paralysis really hit home. Here I was, for the first time since myelitis hit, on my own ground. It wasn’t the big things that I couldn’t do; rather, it was the intimate, day to day movements that I had taken for granted since I was roughly one-year-old. Now, I couldn’t put on my underwear without help. Rita had to do that for me, and put on my socks as well. If I had to go to the bathroom in the middle of the afternoon, when she was at work, to take a dump, would I be able to get my pants back up and tuck in my shirt? There were a lot of realizations, a lot of questions like those, and the loss of ability, of control over my life was devastating at first. In time I adjusted, but my initial response: I cried, of course. In essence, I didn’t know who I was at that point, having just entered this new existence. Keep in mind that a lot of the time I sat there, my arm on my chest at a 45 degree angle, my hand curled into a claw. I didn’t know what I could do; I had no idea how much I would recover, and what new assets—new skills, new hobbies, new friends, new ideals—I would gain. Or how or to what extent I would adjust. Alice Trillin once remarked that the worst thing a serious disease can do “is rob you of your identity.” She was dead on right. And I was just starting to come to grips with how much I had lost. Rita’s response to all this: each and every time I cried—there were endless episodes– she would cradle my head and hold me. Remembering her love, her smile, makes the tears want to drop again, as I write this. She never wavered. The immortal moment came a couple of days after I got home. Filled with fear, with the possibility of the most horrid imaginable scenario playing out, I posed the question which, for me, filled the room. As Rita sat on a stool in front of my newly purchased hospital bed, putting on my socks, I gulped and asked her. “This is not what we had figured on for our marriage. For our future together. How do you feel about us?” I was petrified, screaming inside, but had to do this; our marriage had been built on openness and truth. If she didn’t want to stay, I couldn’t, would not keep her, no matter the loss to me. Transverse Myelitis doesn’t change people. And more than anything, it doesn’t change love.